Isaac lived a hundred and eighty years. Today we will look at one of the patriarchs of the Israelites – Isaac the son of Abraham, and examine his life and the notable events of his life in chronological order, from his miraculous birth to his ultimate death. Isaac may be the patriarch with the least screen time in Genesis – there was a lot more chapters on Abraham, Jacob, and even Joseph then there ever was for Isaac, but while Joseph isn’t known as a patriarch, Isaac is undeniably one. In numerous instances in the Bible, be it the Old or the New Testament, whenever the heritage of the Israelites was brought up, they would tend to say something like the descendents of Abraham, Isaac and Jacob, and God repeatedly referred to himself as the God of Abraham, the God of Isaac, the God of Jacob, often reminding his people of his convenant and oath with Abraham, Isaac and Jacob as well. There are so many instances when the patriarchs of the Israelites were named and mentioned – numerous times in the book of Exodus, Leviticus, Numbers, Deuteronomy, mentioned in the gospel books by Jesus, mentioned by the apostles, and in many other places – too many for me to point them out one by one. 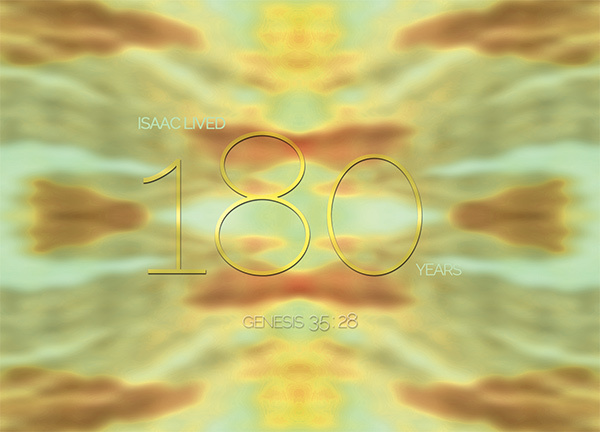 Isaac was also the patriarch who lived a longest life – 180 years to be exact [Gen 35:28], 5 years more than his father. It was kind of ironic because he must have thought his death was near when he decided to give Esau his blessings [Gen 27:2], and yet he lived another 43 years after that. Blessing? Perhaps not – those 43 years were spent with his sons estranged and away from him. Isaac was a miracle baby, born to Abraham and Sarah against human expectations when the man was a hundred years old [Gen 21:5]. He was also called a child of promise [Gal 4:28] and a heir of promise [Heb 11:9], and the Lord made him the promise that was first made to his father – “Do not go down to Egypt; live in the land where I tell you to live. Stay in this land for a while, and I will be with you and will bless you. For to you and your descendants I will give all these lands and will confirm the oath I swore to your father Abraham. I will make your descendants as numerous as the stars in the sky and will give them all these lands, and through your offspring[a] all nations on earth will be blessed,[b] 5 because Abraham obeyed me and did everything I required of him, keeping my commands, my decrees and my instructions.” [Gen 26:2-5]. That promise was often brought up in the Bible after his death. At that point in time Isaac obviously did not know that he was supposed to be the lamb that day, but as he grew up, surely it must have struck him at some point what was that entire episode about. Because Abraham did not withhold his son from God, his previous son whom he had gained at a mighty old age and loved more than anything else – God rewarded him with the promise of blessing [Gen 22:17-18]. We know that he loved Rebekah – he was notably the only patriarch of Israel to only have one wife and no concubines. He was a man of obedience, faith and prayer; as noted by his submission to his father’s plans for him for a wife, and his faith in God when forced to move away from Abimelech. Yet while he started well, it seemed as if something went wrong somewhere in his family – which all combusted when he tried to bless Esau secretly, got deceived by Rebekah and Jacob, and the family split up from then on. There were signs of his weaknesses even before his twins were born. At Gerar, he lied and pretended Rebekah was his sister, much like how his father Abraham had done on two occasions. We know he loved Rebekah as a fact – he loved her enough to be caught caressing her even when they were pretending to be siblings. Yet his fear for his life outweighed his love for her, and in lying to protect his own life, he was in fact throwing Rebekah to the lion’s den. Yet they survived through that, until the twins were born, and Isaac became blind and old. As much as I’d love to discuss the whole incident of the ‘wrong’ blessing, seeing how it was a whole lot of secrecy and trickery that was going on, that is a discussion for another day. His family split up – he didn’t die like he probably expected to after giving the blessings. He outlived the wife whom he loved – he lived long enough even after he had thought his time was near, long enough to see Jacob returning from the house of Laban. The Bible didn’t say, but I would like to think that the last years of his life were spent in misery – the death of his beloved wife, the departure of his son Jacob, and the iniquities of his son Esau. At least, he died reunited with Jacob. Isaac was one of the patriarchs of the people of Israel, in fact, his son Jacob was Israel. While his screen time in the Bible cannot be compared to his father or even his son, there is still many significant lessons we can take from him. 180 years – that’s a long life to live. He started his life well, but perhaps at some point in those long years of his, his spiritual life stagnated. His family got entangled in a web of lies and eventually split up. Yet God had amazing things in store for this family, and every single one of God’s promises were adhered to regarding them.